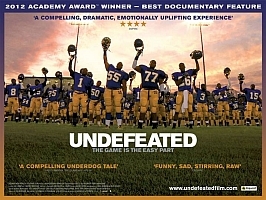 After surprising many by winning the Academy Award for Best Documentary this year, Dan Lindsay and T.J. Martin’s tale of an underprivileged community’s poorly funded football program dramatic rise to prominence, Undefeated (2011) finally arrives in UK cinemas. Manassas, Tennessee used to be a town with a thriving industry, yet the recent American economic crisis has now left the neighbourhood in a dilapidated state. The town’s football program has experienced some lean years, slowly succumbing to a ten year losing streak, finding itself having to play, pay-to-pay games against far more experienced and better funded teams – culminating in a detrimental affect on the schools moral and the area’s rapidly declining status. However, the arrival of coach Bill Courtney has installed a sense of belief into this team of underprivileged youngsters, using football’s power to allow students to escape the poverty of small town life as a catalyst to install some much needed confidence to these insubordinate kids. Whilst observing the ‘Manassaa Miracle’ of the Tiger’s unexpected run to the play offs makes for a riveting and uplifting experience, it’s the individual stories of Undefeated which are the most intriguing. The stories of Chavis, Montrail and OC are all full of incredible examples of faith overcoming adversity, however, the most fascinating character is Coach Courtney. Volunteering in order to give something back to this underprivileged community, the sense of excitement and belief he installs into this collection of wayward teens is remarkable, successfully installing a mental toughness to this rabble of unruly players. Much Like Asif Kapadia’s Senna (2011), the success of Undefeated lies in its humanist examination of the players behind the helmets. Far more about building yourself and discovering your true character than it is about the score on the field, Undefeated successfully immerses us into the dressing room, showing the power of sport to change lives. Indeed, like all good sport films you need little to no knowledge of American Football to enjoy this powerful drama about the strength of character and the camaraderie of a team. Very much a real life version of Peter Berg’s surprisingly stirring Friday Night Lights (2004), Undefeated is just as dramatic and powerfully emotive as the greatest of fictional sports films. A deserving Academy Award winner, and the epitome of what a good sports documentary should be.